Thank you for ‘bringing me into the fold’, Sophie. 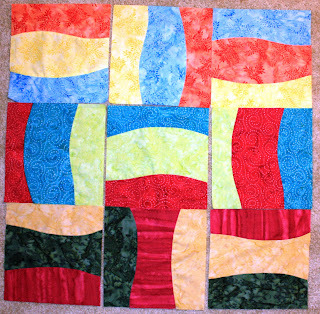 These are my first lotto blocks – though I got previous patterns made, just not in time for the lotto. These were fun and colorful. I have to admit to loving batiks! As you see, I made the max of 9. Having sewn clothing before, curved piecing isn’t a lot of challenge, though it HAS been awhile. I see I left a ripple while taking the picture, though. Now that I’m done sewing these, I can cross my fingers for luck! My name is Corinne. My husband and I retired here to Forks, Washington, USA about 5 years ago – before the “Twilight” hype started. Forks is on the Olympic Peninsula, west of Seattle and Puget Sound, in the middle of beautiful forests, including the only temperate rainforest in the continental US – which means we get about 10 FEET of rain each year. Yes, I mean feet. For more pictures of Forks and the West End (of the peninsula), you can click to go to my blog. I used to post there a lot more often, and haven’t really done a lot lately, but the archives have a lot of shots we’ve taken around the peninsula. It’s really beautiful here! Welcome Corinne and may I say wow! (about the rain). And here I was down in the dumps about the 4 days of on and off rain we're having on Long Island, NY. It just shows how everything is relative. Anyway, good luck with the 'lotto' drawing. Joan T.